Anita beat 36 other contestants at the Most Beautiful Girl in Nigeria contest that held on Friday at Gabriel Okara Cultural Center, Bayelsa State. She will represent Nigeria at the Miss World 2018 in China. The pageant was hosted by Toke Makinwa and Ik Osakioduwa. 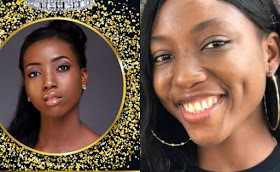 The first runner-up is Aramide Oluwatobi Lopez, who represented Lagos), the second runner-up was Danielle Jatto (Miss Edo), the third runner-up, was Valentina Ogbonaya (Miss Sokoto), the fourth runner-up was Tolulope Mary Ayanfalu (Miss Ogun) and Miss Kwara, Damilola Adeshina emerged the fifth runner-up.